Immerse yourself in this magical tour of Turkey and Jordan covering major highlights of ancient and historic civilizations. Be amazed by the iconic sites of Petra, the Ajloun Castle and the Temple of Hercules that date back thousands of years. 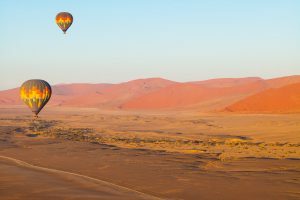 Delight in a hot air balloon ride over Wadi Rum Desert of Jordan at sunrise. 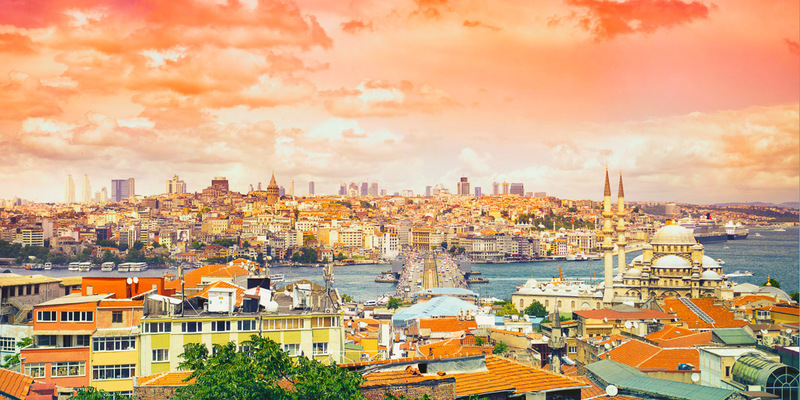 The sites from Istanbul to Amman, two of the longest continuously inhabited cities in history, are endless. We are excited to share this itinerary with you and explore the delights that these two ancient countries have to offer! Treat yourself to a great time of photography, relaxation, creativity and join a community of photographers committed to excellence! Photography Instruction: Mohan will work personally with each participant. 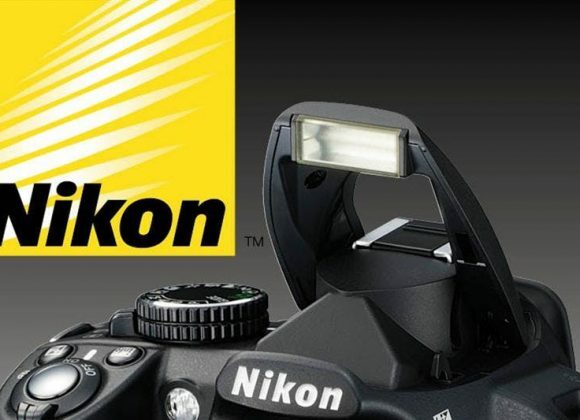 We believe in taking our participants to new levels in their understanding of photography. Anyone can take you to a beautiful place and tell you what to set your camera at. We strive to teach our participants how to tell the camera what they want the creative outcome to be. If you have any questions or concerns, you may contact Photography Instructor Mohan Bhasker at (310) 944-2625 or this tour’s director Michelle Parra at (818) 281-9991. Welcome to a land rich in archaeological sites, historic monuments and a huge variety of spectacular scenery. On arrival at Istanbul Airport, you will be received by our tour executive and transferred to your Hotel. Overnight in Istanbul. Basilica Cistern—the largest of the ancient cisterns that lie beneath the city of Istanbul, built in the 6th century. It is a chamber able to hold near 80,000 cubic meters of water, with the roof supported by 336 columns made of marble and arches in between. Grand Bazaar—one of the largest and oldest covered markets in the world with 61 covered streets and over 4,000 shops with traditional Turkish handicrafts. Spice Bazaar—built in 1664 is Istanbul’s fragrant central market for all things flavorful. A must-see experience. Dolmahee Palace—one of the most glamorous palaces in the world and used as the final residence of the Ottoman sultans. 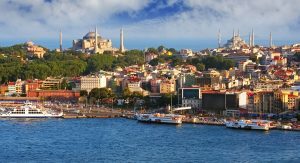 Sightseeing Bosphorus Cruise—we will take you for a scenic 1.5-hour cruise through the Bosphorus strait which flows right through the heart of Istanbul from the Black Sea to the Sea of Marmara, bridging the gap between Europe and Asia. Transfer to Istanbul Airport and take an evening flight to Amman, Jordan (2-hr/25 minute flight). Overnight in Amman, Jordan. After an early breakfast we will check-out and tour the following sites on our way towards Petra. Jerash-we will take a 52-minute drive to Jerash. We will explore the 2000-year old Roman Ruins. Hidden for hundreds of years under the shifting sands of Jordan, picturesque ruins are all the remains of a once-great ancient city. The ruins were excavated and have been restored over the past 70 years. 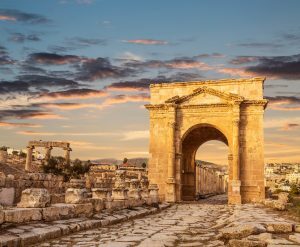 Today Jerash is one of the largest and best-preserved Roman cities in the world, and is a popular destination for those who would like to witness the majesty of Roman architecture, marvel at extraordinary well-preserved mosaics and carvings. Madaba “City of Mosaics”-is home to the famous 6th century Mosaic Map of Jerusalem and the Holy Land. With 2 million pieces of vividly colored local stone, it depicts hills and valleys, villages and towns as far as the Nile Delta. The Madaba Mosaic Map covers the floor of the Greek Orthodox Church of St. George. Mount Nebo- a Holy site in Jordan said to have been the place where Moses saw the Promised Land before he died as mentioned in the Old Testament. The view from 800 m summit provides us with a panorama of the Holy Land, Dead Sea and part of the Jordan River Valley. Visit Petra at night-(2- hour tour) Petra is lite by 1,800 candles. 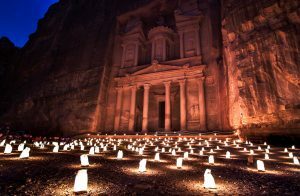 We will walk through the Siq to the Khazneh following a candle-lit path and enjoy the haunting music of the Bedouins at the treasury. Overnight in Old Village Hotel in Petra. After breakfast, we enter the world-famous UNESCO World Heritage Site of Petra, also known as the “Rose City” due to its rose-colored rocks. 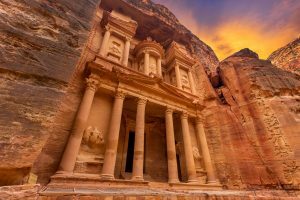 UNESCO has called ancient stone city of Petra “one of the most precious cultural properties of man’s cultural heritage”. Enter the city through 1-km long narrow gorge which is flanked either side by 80 m high cliffs. The site is massive, and contains hundreds of elaborate rock-cut tombs, a treasury, Roman-style theaters, temples, sacrificial altars and colonnaded streets. Prepare to be mesmerized as you enter the city through the dramatic main entrance known as the Siq, a narrow entry point created when the mountain split in two. Carved directly into vibrant red, white, pink and sandstone cliff faces, the prehistoric Jordanian city of Petra was “lost” to the Western world for hundreds of years. Overnight in Old Village Hotel in Petra. After breakfast, we will visit Little Petra best known as Al Beidha (the White One) due to the pale rock colors. Little Petra, also known as Siq al-Barid (literally “the cold canyon”) is an archaeological site located north of Petra and the town of Wadi Musa with buildings carved into the walls of the sandstone canyons. As its name suggests, it is much smaller, consisting of three wider open areas connected by a 1,480 ft canyon. It is part of Petra Archeological Park, though accessed separately. Overnight in Old Village Hotel in Petra. Camel Ride through the dunes. Exciting 4 x 4 jeep excursion into the desert where we pick the perfect spot to photograph the sunset. 4-hour drive back to Amman International Airport for flight departure. Instructor Bio: Mohan Bhasker’s formal education made him a doctor, but the things he experienced while exploring with his camera made him the person he is today. Mohan conducts photography expeditions all over the world for photographers of all levels. He has traveled and photographed all seven continents. He is primarily a landscape photographer and prefers film as his main media. Mohan is very passionate about black & white photography and create silver gelatin & platinum prints in his darkroom. Mohan strives to make images that offer a tribute to the uniqueness of the remote places he has visited, reflecting his appreciation of the beauty, history, and significance of each location. Mohan has published two books, both books titled ‘Seven Continents’ one published 2012 and 2015. If for any reason you need to withdraw, please notify us at least 90 days before the start of your workshop. At that time we will refund your deposit, less a $300 cancellation fee and less $200 for the non-refundable airfare ticket. If notification of cancellation is made less than 90 days before the start of the workshop there will be no refund. We reserve the right to cancel a reservation if full payment has not been received by 90 days before the start of the workshop. Samy’s Photo School is not responsible for cancellations due to medical emergencies. We highly recommend purchasing Travel Insurance. In the event that a workshop must be canceled due to inadequate enrollment, all fees and deposits are refunded in full. Samy’s Photo School is not responsible for reimbursement of non-refundable airline tickets in the event of a workshop cancellation. Please check on your workshop status before making travel arrangements. 1. RISK FACTORS. By registering for this workshop I understand and acknowledge that traveling and or services provided through the Workshop, may involve risks such as, but not limited to, risk of property damage, theft, bodily injury and possible death, which might result from the activity itself, from the acts of others, or from the unavailability of emergency medical care. 2. ASSUMPTION OF RISK. I thoroughly understand the hazards of participating in the specified travel. By signing this release, I certify that I am fully aware of and expressly assume these and all other risks involved in traveling. I assume all risks (including known and unknown) that arise out of the use of the equipment, the facilities, the activity itself, the act of others and/or the unavailability of emergency care, including but not limited to, those risk factors described in section 1 above. My participation in this Workshop is purely voluntary; no one is forcing me to participate and I elect to participate in spite of all known and unknown risks. 3. PREREQUISITE SKILLS AND PHYSICAL FITNESS. I acknowledge that I have the requisite skills, qualifications and physical abilities to participate in the workshop. I certify that I have no health-related problems/reasons that preclude participation in the workshop. 4. RELEASE. I understand and agree that neither Samy’s nor its Instructors, Sony, Sony Alpha Universe, Employees or Agents nor its affiliates or subsidiary corporations may be held liable or responsible in any way for any occurrence on this workshop which may result in personal injury, property damage, wrongful death or other damage to me or my family, heirs, or assigns that may occur as a result of my participation in this workshop or as a result of the negligence of any party whether passive or active. I waive, release and discharge Samy’s from any and all liability, including but not limited to, liability arising from the negligence or fault of Samy’s, for death, disability, personal injury, property damage, property theft, accident, cancellation, delay, alteration, inconvenience or actions of any kind which may hereafter occur to me, including traveling to and from the workshop. I agree not to sue Samy’s on account of or in conjunction with any claims, causes of action, injuries, damage, cost of expenses arising out of the workshop (including traveling to and from), including but not limited to those based on death, bodily injury, disability property damage or theft whether or not caused by the acts, omissions, negligence or other fault of Samy’s. I acknowledge that Samy’s is not responsible for the errors, omissions, acts or failure to act of any party or entity conducting a specific Workshop on behalf of Samy’s. Samy’s Camera, its members, employees and agents, give notice that all services and arrangements related to this workshop have been made by Samy’s Camera, only as agents upon the express condition that Samy’s Camera shall not be liable and does not assume responsibility for any claims, damages, expenses or other financial loss whether to person or property arising out of any injury, accident, death, cancellation, delay, alteration, or inconvenience resulting from any act of omission, commission or inadvertence of any hotel, carrier, restaurant or other company or person rendering any of the services included in the workshop or its pre and post tour arrangements, or caused by weather, sickness, strikes, quarantines or the willful or negligent acts of any other workshop members or any cause whatsoever beyond the control of Samy’s Camera. 6. INDEMNIFY AND DEFEND. I agree to indemnify and defend Samy’s (also referred to below as “indemnitee”) against, and hold Samy’s harmless from any and all claims, causes of action, damage judgments, costs or expenses, including attorney fees which in any way arise from the Workshop or this Agreement which include but are not limited to damages to or destruction of any property of the indemnitee, of any others, my injury or death or anyone else or any liability arising from the act or negligent act of the indemnitee, myself or anyone else. 7. PAY. I agree to pay for any and all damages I have caused either negligently, willfully, or otherwise to any property or individual during the Workshop (including travel to and from). 9. EMERGENCY TREATMENT CONSENT. I, as a participant in the Workshop, hereby consent to medical treatment in a medical emergency where I am unable to consent to such treatment. 10. INSURANCE. I understand that Samy’s does not carry participant insurance. I understand that I am encouraged to have a physical examination and to purchase health insurance prior to any and all participation. 11. IMAGES. I understand that I might be photographed and/or filmed at the Workshop and/or related activities. I hereby consent to being photographed and/or filmed at the Workshop and/or related activities. I understand that any image or images (including any video or film), containing my likeness taken during the Workshop and/or related activities (hereinafter the “image”) are the property of Samy’s, and may appear in various publications, modes of communication, advertising and social media including but not limited to the Samy’s website, Twitter, Facebook and other such media. My signature below grants Samy’s and the photographer of the image the following worldwide, irrevocable rights, in perpetuity: to use and re-use, publish and re-publish, disseminate, modify or alter, and copyright such images of me, or in which I may be included. Use of such images of me for editorial, commercial, trade, marketing, advertising, or any other purpose may be made in any medium now existing or subsequently developed. I waive my right to inspect or approve any such images of me and/or any editorial matter or advertising copy that is used in connection with any such images. My signature below grants Samy’s the right to sell by auction or any other mode of sale the images as determined by Samy’s in its sole discretion. I hereby waive all rights to any kind of compensation for Samy’s use and/or sale of the images. I release and discharge Samy’s and the photographer from any and all claims arising out of use and/or sale of such images by Samy’s and the photographer for the purposes described above, including any claims for libel, copyright violation, invasion of privacy and compensation. 13. DEPOSIT AND PAYMENT. The price of the workshop is a per person price for adults 18 years and older based on double occupancy (unless otherwise stated), excursions as specified in itinerary and the services photography instructor(s), local tour guide and driver. Restrictions may apply. All prices are subject to availability and change without notice. A deposit of $1060 per person, per workshop is required to confirm a reservation. The balance of the workshop fee is due 75 days prior to departure. If the balance is not paid when due, Samy’s Camera reserves the right to regard the reservation as canceled. Samy’s Camera reserves the right to cancel the workshop for any reason. In such an instance, we will refund all payments received, which will constitute full settlement. Samy’s Camera reserves the right to accept, remove, retain or decline any trip member at any time for any reason. In such case, a refund equal to the actual cost of the unused services is the limit of Samy’s Camera’s responsibility. By enrolling, I understand that if I need to withdraw from this workshop, I will notify Samy’s Camera at least 90 days before the start of the workshop. I understand that if I cancel my reservation for the workshop, my cancellation is subject to a $300 cancellation fee and $200 for the non-refundable airfare ticket. If notification of cancellation is made less than 90 days before the start of the workshop there will be no refund. Samy’s Camera reserves the right to cancel a reservation if full payment has not been received by 90 days before the start of the workshop. Samy’s Camera is not responsible for cancellations due to medical emergencies. Samy’s Camera is not responsible for reimbursement of non-refundable airline tickets in the event of a workshop cancellation. Please check on your workshop status before making travel arrangements. 12. GOVERING LAW AND ARBITRATION. 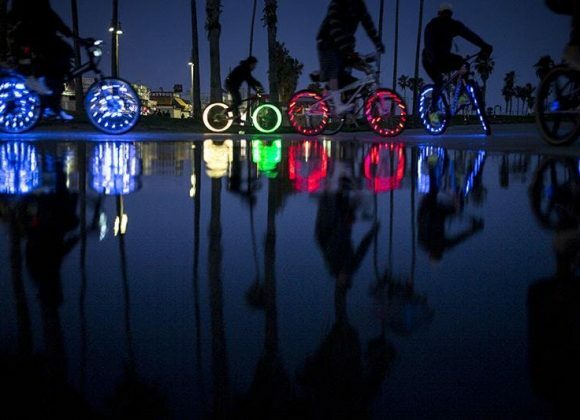 The validity, interpretation and performance of this Agreement shall be governed by and construed in accordance with the laws of the State of California without regard to its conflict of law principles. The parties agree that any controversy, claim or dispute between them or against any agent, employee, successor, or assign of the other, whether related to this Agreement or otherwise, and/or the relationship or duties contemplated under this Agreement including the validity of this arbitration clause, shall be resolved solely and exclusively by binding arbitration by the American Arbitration Association or other arbitration association mutually agreed upon by the parties. Any arbitration hearing shall take place in Los Angeles, California, under the Arbitration Rules then in effect. Any award of the arbitrator(s) may be entered as a judgment in any court of competent jurisdiction. The parties agree to abide by all decisions and awards rendered in such proceedings. Such decisions and awards rendered by the arbitrator shall be final and conclusive. The costs of any arbitration shall be borne equally by both parties pending the arbitrator’s awards. The arbitrator shall not have the right to amend this Agreement. The arbitrator shall be required to follow applicable law. If for any reason this arbitration clause becomes inapplicable, each party to the fullest extent permitted by applicable law, hereby irrevocably waives all right to trial by jury as to any issue relating hereto in any action, proceeding or counterclaim arising out of or relating to this Agreement or any other matter involving the parties hereto. 14. ACKNOWLEDGMENT. I acknowledge that I have read and comprehend this Agreement. I fully understand the potential dangers incidental to engaging in this boat trip and scuba dives, am fully aware of the legal consequences of signing up for the workshop this Agreement and that I understand and agree that this Agreement is legally binding and will preclude me from recovering monetary damages from the above listed activities and/or individuals, whether specifically named or not, for personal injury, property damage or wrongful death caused by product liability or the negligence of the released parties, whether passive or active. I acknowledge and understand that this Agreement relates to surrendering valuable legal rights and I do so freely and voluntarily.